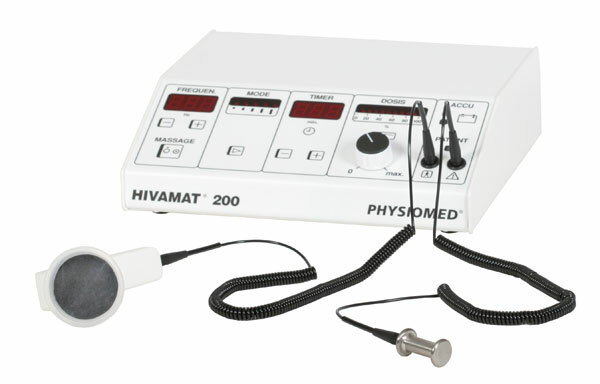 We have been using the Hivamat 200 for the past nine months with a variety of our patients who attend the hospital for Physiotherapy and have found it to be an excellent adjunct to the treatments that we offer. ... We have used the Hivamat across both our paediatric and adult client group to reduce swelling and pain post injury, post surgery and post natally. We have found it to be to of particular relief to patients in reducing discomfort and swelling around the abdominal area following gynaecological surgery. 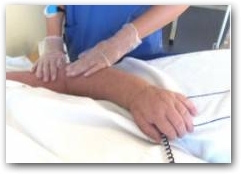 However the area in which the Hivamat has consistently provided us with beneficial results has been in the treatment of patients suffering with lymphoedema. We have observed that it aids the reduction of swelling, loosens fibrotic tissue (which often seems to be present post breast surgery) and our patients have reported the experience of lightness in the treated area and a feeling of well-being. These effects cannot be understated as lymphoedema can be very uncomfortable and difficult to manage and so being able to provide any sort of relief is, we feel, invaluable. Testimonial provided for the HIVAMAT 200 from The Portland Hospital for Women and Children. \"The Hivamat has consistently provided us with beneficial results in the treatment of patients suffering with Lymphoedema.\"
The Hivamat 200 used - internationally patented technology used for treatment and maintenance of Lymphoedema. Application through vinyl gloves or applicators.